Out of all ancient cookbooks and recipes collections, Apicius is the most famous one, and possibly the most impactful. It is the only surviving complete cookbook from the Roman Empire. Written sometime between 1st and 4th centuries CE, its authorship is disputed, most scholars considering it not written by a single author. Marcus Gavius Apicius, a Roman gourmet who flourished during Tiberius’ reign in the 1st century CE, most probably did not write the book that carries his name. As mentioned by Juvenal in the 2nd century CE, the name Apicius was a term used to describe any foodie since the days of Marcus Gavius Apicius. It is suspected by modern scholars that many recipes in the book were written by slave cooks who used a very crude form of Latin that would not have been used by the elites. There are two extant manuscripts of Apicius. Both of them have been fully digitized and can be viewed online for free in their full grandeur. The first manuscript, known as the Fulda Apicius, is kept at the New York Academy of Medicine Library (Apicius. [De re culinaria, Libri I-IX]. s.n., [9th century].). It was written on vellum, by several different scribes in a mix of Anglo-Saxon and Carolingian scripts at the monastery at Fulda, Germany, around 830 CE. The Fulda manuscript is not illuminated, containing only the Latin text of Apicius without any drawings. 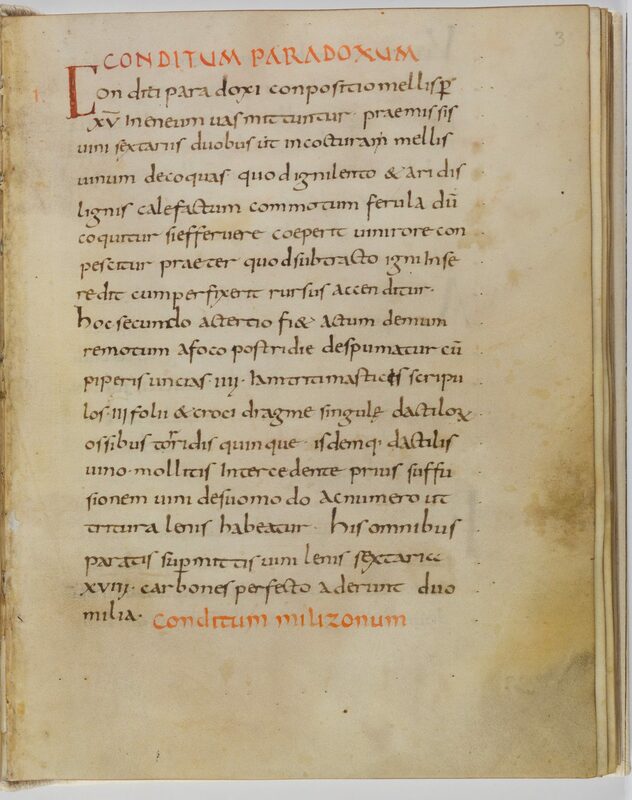 Fulda Apicius Manuscript, Folio 4, depicting Coditum Paradoxum Recipe. New York Academy of Medicine Library Apicius Manuscript. New York Academy of Medicine Library. The second manuscript, known as the Vatican Apicius, is kept at the Vatican Library (Urb. Lat. 1146) in Rome, Italy. It is an illuminated manuscript, written for someone who was extremely wealthy. The Vatican Apicius was written and illuminated in St. Martin of Tours, France, in the 9th century, under Abbot Vivian (844-851 CE) and it has been proposed that it was written as a gift for the French king, Charles the Bald. The manuscript traveled around before reaching the Vatican Library. It was in Bologna, Italy in 1464, after which it joined the collection of the Montefeltro dukes, in Urbino. In 1658, the Vatican Apicius manuscript was included in the collection of the Vatican Library under the Urbinati Latini manuscript group. 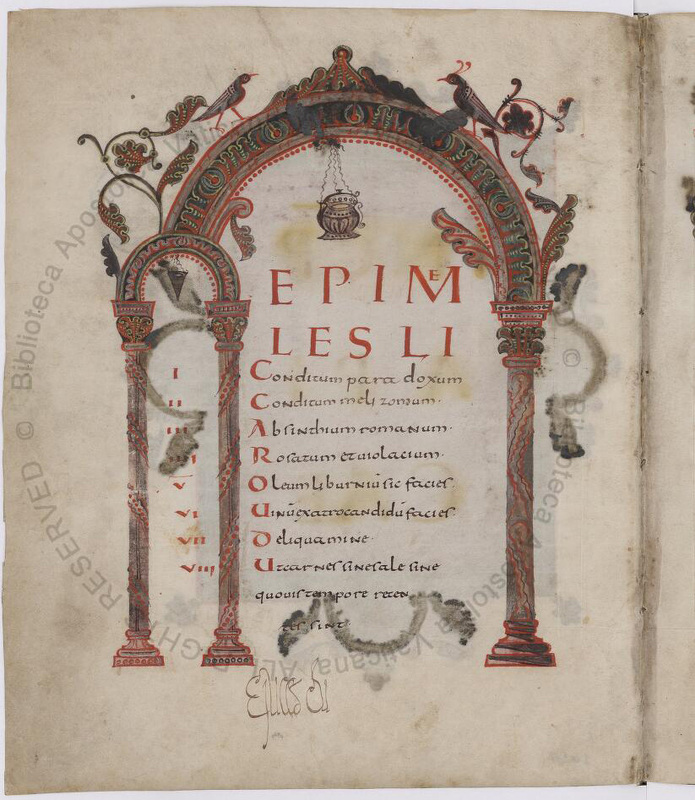 Vatican Apicius Manuscript, Folio 1v, depicting the title page. Vatican Libraries Manuscript Urb.lat.1146. Rome, Italy. Hey Buddy!, I found this information for you: "Manuscripts of Apicius". Here is the website link: http://www.ancientrecipes.org/manuscripts-of-apicius/. Thank you.